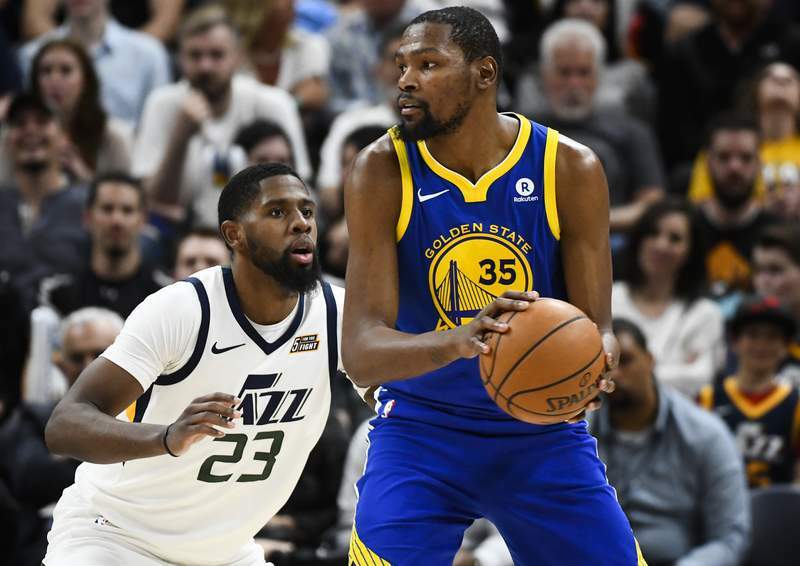 Associated Press The banged-up Golden State Warriors and forward Kevin Durant, who was among those who missed games down the stretch, lost six of their last 10 to close the regular season. The postseason opens Saturday and it's far from a guarantee it ends with a record fourth straight NBA Finals matchup between the Warriors and Cavaliers. Neither was the best team in its conference during the regular season – the Cavaliers were only No. 4 in the East – and it's not hard to envision a Houston to Toronto trip replacing what's become an annual Oakland-to-Cleveland itinerary. And the other top contenders have to overcome their history of disappointments. Houston's Mike D'Antoni and James Harden have never won, and Chris Paul hasn't even gotten out of the second round. The Raptors had their best regular season ever, but they were last seen in the postseason getting stomped in four straight by James and the Cavs last year in the second round. On Sunday, it's No. 7 Milwaukee at No. 2 Boston, and the Cavs hosting the No. 5 Indiana Pacers in the East, followed by No. 5 Utah at No. 4 Oklahoma City. The Rockets wrap up opening weekend against No. 8 Minnesota, ending the NBA's longest playoff drought with its first playoff appearance since 2004. Curry's injury is the only one that remains, but the Warriors at one point down the stretch were also without Kevin Durant, Draymond Green and Klay Thompson, too. Even the champions couldn't overcome that, dropping six of their final 10 games, but they start against a San Antonio team whose injury problems are every bit as bad, assuming Kawhi Leonard doesn't return after missing almost the entire season. Philadelphia is the hottest team, winning its final 16 games to finish 52-30. But the 76ers are led by postseason newcomers Joel Embiid and rookie Ben Simmons – and Embiid is recovering from a broken orbital bone and concussion as the postseason begins – and will have to overcome their inexperience and a rugged Miami team. It was an up-and-down regular season for Oklahoma City, which acquired Paul George and Carmelo Anthony to play with Russell Westbrook but finished well back of Houston and Golden State. But the Thunder might be one of those teams better built for the postseason, and they got an easier road when they won three straight to grab home-court advantage against a Utah team that would have had it before a season-ending loss at Portland. There's no more Kyrie Irving and there was only Gordon Hayward for a few minutes all season, so the Celtics are being overlooked despite their No. 2 seed in the East. But there's plenty of young (Jayson Tatum and Jaylen Brown) and veteran (Al Horford, Marcus Morris) talent on a 55-game winner that features one of the league's best coaches in Brad Stevens. As good as Toronto is, it seems futile picking against James and the firepower around him to get to the NBA Finals. But the Cavaliers don't defend well enough and can be picked apart by top offenses, so go with the West champion to win the title, particularly if it's Golden State or Houston. “I like Houston and Golden State, pending their health, as being my top two favorites,” five-time winner Kobe Bryant said.